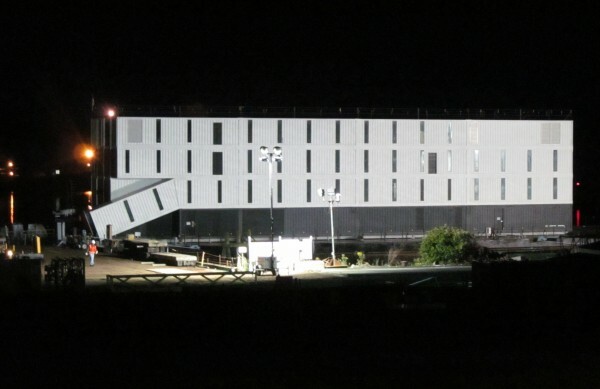 A mysterious four-story structure is docked on a barge at Cianbro's Rickers Wharf Marine Facility on the West End of Portland Thursday night. The structure was shipped to Portland from Connecticut, where it was shrouded in secrecy and the focus of intense speculation. 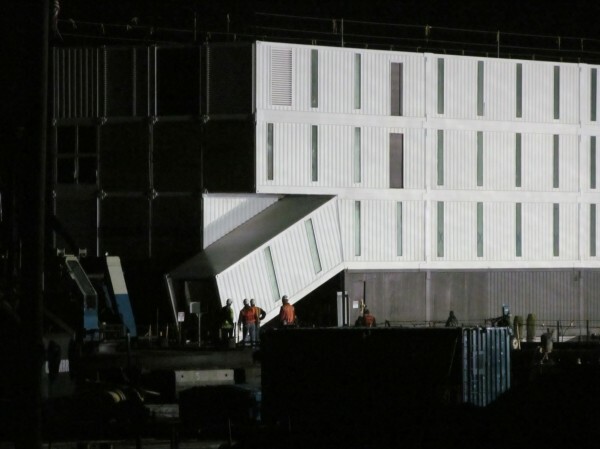 Workers at Cianbro's Rickers Wharf Marine Facility in Portland on Thursday night inspect what appears to be a ramped entrance into a box-like four-story structure delivered there by barge. Cianbro CEO Peter Vigue said he cannot divulge what the structure is or who hired his company to work on it. The tugboat Rowan W. McAllister leads the "mystery building" on its barge down the Thames River bound for Long Island Sound from the Admiral Harold E. Shear State Pier in New London Wednesday, Oct. 9, 2013. PORTLAND, Maine — A four-story structure that has been the topic of intense speculation in Connecticut arrived in Portland by barge shortly after 7 p.m. Thursday. People in Maine remain as confounded as their Connecticut counterparts about what it is, who it’s for and where its final destination will be. The mysterious box-like structure was built by Turner Construction at the Adm. Harold E. Shear State Pier in New London, Conn., and was shipped out from that location on a barge bound for Maine’s largest city around midday Wednesday, The Day newspaper of New London reported. The Day reported that the barge was accompanied by a Portland Tugboat LLC tug on its voyage, and that around Connecticut waterfront circles, the building was rumored to be anything from a movie set to a floating prison to a top secret Defense Department project. Nicole Clegg, spokeswoman for the city of Portland, said the city won’t be involved with the project. 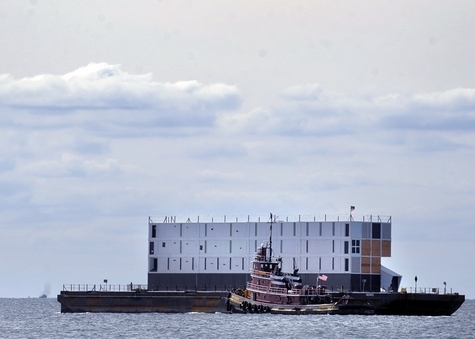 The barge carried the structure along the waterfront to Rickers Wharf Marine Facility in Portland, which is operated by Cianbro, a Pittsfield-based contractor. Cianbro CEO Peter Vigue told the Bangor Daily News the project is “very important,” and acknowledged that Rickers Wharf was the destination of its voyage from Connecticut. But Vigue said he couldn’t confirm what kind of work his company is doing on the building. The Cianbro executive suggested that the mysterious project could lead to more work for the Maine company if successful. “We can’t jeopardize the client’s current position on this project or our potential opportunities as well,” he said. John Henshaw, executive director of the Maine Port Authority, said that although he doesn’t know what this specific project is, it doesn’t appear completely alien to him. “It looks similar, at least from the picture I saw in the paper, to other modularly constructed buildings that Cianbro has worked on in the past,” Henshaw said, referring to a 2009 modular refinery project in Texas and a more recent Newfoundland nickel mining project build. The last of the 22 modules in the Newfoundland project were shipped out from Brewer last year. That project employed more than 100 workers, Vigue told the Bangor Daily News at the time. Modular structures — whether homes or more industrial buildings — are generally constructed using large, plumbed and wired puzzle pieces of sorts that were assembled off-site and then fitted together to make a single building at a desired location.